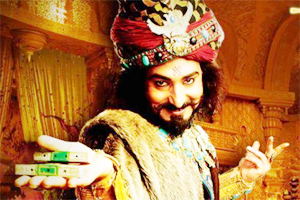 Veer Munshi has addressed a range of subjects in the course of an artistic career that spans 17 years and has been conducted in several cities, including Baroda, Srinagar, Bombay and New Delhi. But exile remains his most fundamental condition and preoccupation. Munshi has essayed variations on the self-portrait; he has explored the possibility of revitalising the genre of portraiture by means of playful, irreverent allusiveness. He has studied the effects of schismatic ideologies and the politics of violence across the planet, and reflected on the wages these exact on the trust and affection that bind individuals and communities together. Savouring the experience of travel, he has released himself towards the cultures, image-making practices and political situations of diverse geographical locations. And yet, overtly or through camouflage beneath other concerns, Munshi returns to the key crises of displacement, disorientation, and the loss of shared assumptions of belonging. While he may have perfected the art of masking melancholia with wry humour and softened the edge of self-inquiry with self-irony, the artist remains unremittingly aware that his present is an uncertain transition between a lost homeland and a future mined with shocks and bleak epiphanies. The interplay between the muted tonality of anguish and its opposite, the mandate of attempted detachment, is strongest in the photographs of Kashmir that Munshi has taken over several winters. The hand of snow is heavy on buildings, people, time, and the hope of movement. Our eyes settle on bridges that have almost vanished beneath snow and fog; on roofs that shoulder their burden of whiteness, and also of knowledge; on piles of snow that threaten to reduce steps, arches and walls into mere marginalia before the grander, unforgiving script of the natural cycles. The magic of the word ‘sheen’ comes back to haunt the mind: it is the Kashmiri for snow, neither image nor word to be experienced in the plains or the peninsular reaches of India. Munshi has lived and worked in New Delhi since the early 1990s. 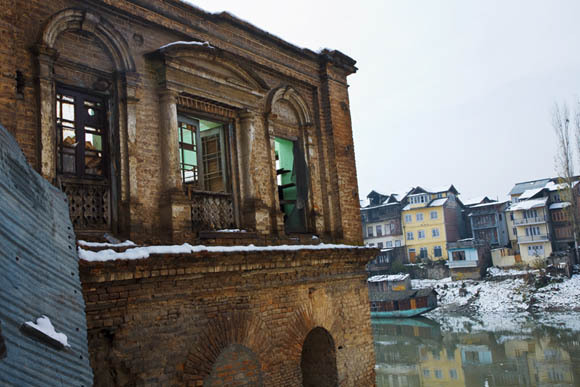 His decision to shift there from Srinagar, the city where he was born in 1955, coincided with the diaspora of his community, the Kashmiri Pandits, from the Valley of Kashmir. 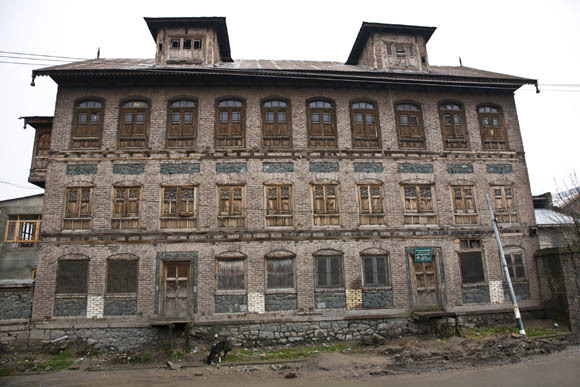 The Pandit diaspora forms an important but neglected strand in the tapestry of Kashmir’s tragedy: a story compounded from violence and counter-violence, militant terror and State terror, obscurantism, low-intensity warfare, and the maintenance of a constant and debilitating state of emergency. 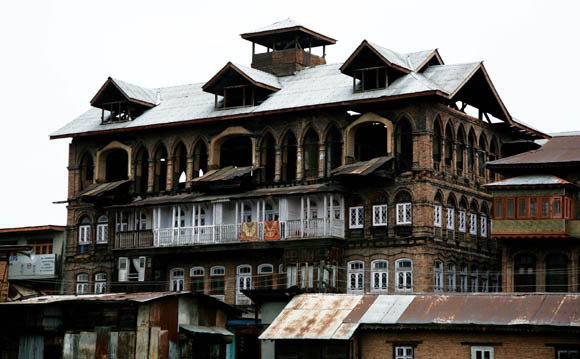 Through the two decades that are described cautiously by people in Kashmir as ‘the time of troubles’ or ‘the period of disturbances’, individuals, families, neighbourhoods and the relationships among the Muslim and the Pandit communities have been devastated almost beyond hope of healing. 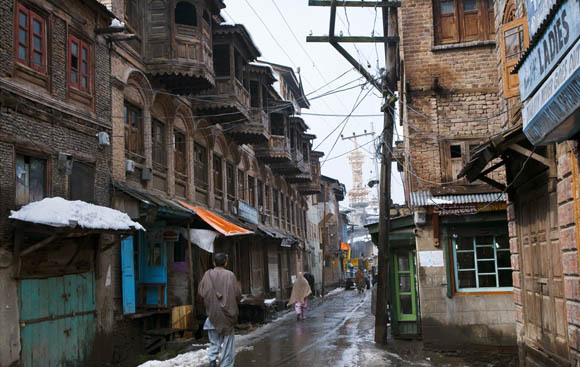 Life has been a nightmare for Kashmiris who live in the Valley; it has been no less harrowing for those who had to leave in fear for their lives. 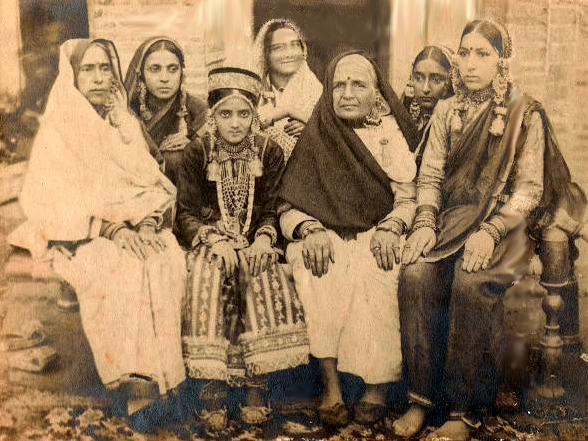 The Pandits fled almost en masse – though a number of them stayed on, either out of courage and conviction, or because they were too poor to shift – after prominent members of the community were murdered by separatists, and an atmosphere of terror was created in which the only option seemed to be an exodus to Jammu or northern India. Where, of course, further misfortune awaited them: twenty years later, hundreds of Pandit families live in wretched conditions in the refugee camps into which they were herded by State agencies (Simha: 2008). In these circumstances, Munshi poses himself certain crucial questions: How does the artist speak for his ethnic group and its suffering, without losing sight of the larger historical contexts within which its story must be told? How can he speak as an artist, an agent of the imagination, without lapsing into the role of spokesperson? How can he reconstruct, in and from memory, a culture, a style of life that has been irretrievably lost? How best can he present these as proposals concerning the anguished present, and not as nostalgic or apocalyptic evocations of a lapsed paradise or destroyed utopia? The task is doubly complicated: not only must the artist resist the corrosions of propaganda and amnesia, but he must also restrain himself from inflating his own suffering, great as it is, into an occasion for cosmic rage. In his most recent and ambitious work, presented for the first time in this exhibition, Munshi addresses this complex predicament through the painting-based environment and the unvarnished documentary photograph. 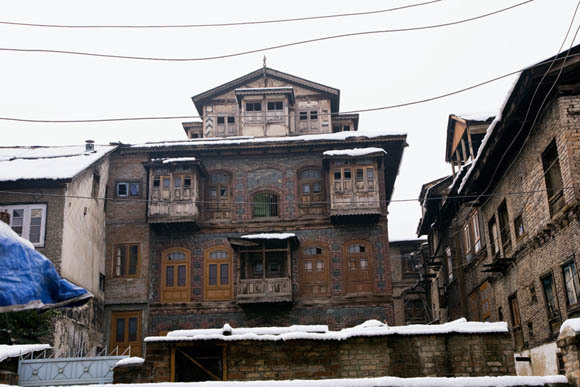 Accordingly, the exhibition, titled ‘Shrapnel’, comprises two new bodies of work: ‘The Chamber’ and ‘Pandit Houses’. These works, which break new conceptual and formal ground, enact a major shift in his trajectory. 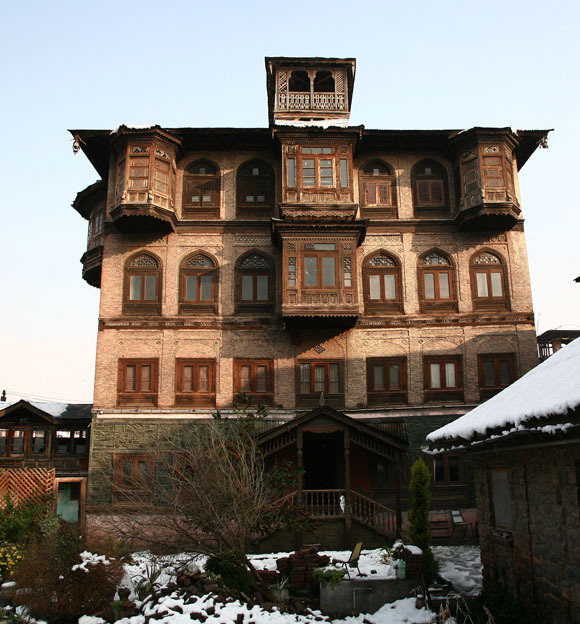 They were achieved as the result of a long process of intensive dialogue between Munshi and myself, interacting as artist and curator, but also as Kashmiris representing waves of diaspora several centuries apart. Both of us were alert to the pressure exerted by our shared origins, as well as to the strictures of a critical history. In ‘Shrapnel’, Munshi has adopted the chosen forms of the elegist: the memorial and the archive. These forms allow him to shift the focus from the image to the conditions that make the image possible, or even inevitable. The Chamber’ is an environment that has evolved organically from his ongoing series of paintings concerning the transmogrification of everyday life in a period dominated by civil strife, terror attacks and endemic violence. In these paintings, his protagonists are agents, pawns or voices of catastrophe: men dodging land mines and negotiating the wreckage of war machinery, protestors agitating in the cause of separatist resistance, animals both symbolic of and trapped in a system of paranoid securitisation (Hoskote: 2006). ‘The Chamber’ is a response to a curatorial proposal that I made to Munshi in 2008, suggesting that he develop a wraparound experience in which his paintings would grow into panels and finally into walls, surrounding and drawing the viewer into a simulation of the zone of conflict: as unwilling participant, reluctant fellow traveller, or shattered pilgrim. The suite of 25 photographs that bears the deceptively spare title of ‘Pandit Houses’, is a documentary photographic narrative of the homes that the Pandit refugees left behind. The series began almost accidentally, on a chance impulse, as research notes that Munshi made during a visit to Srinagar in 2005. 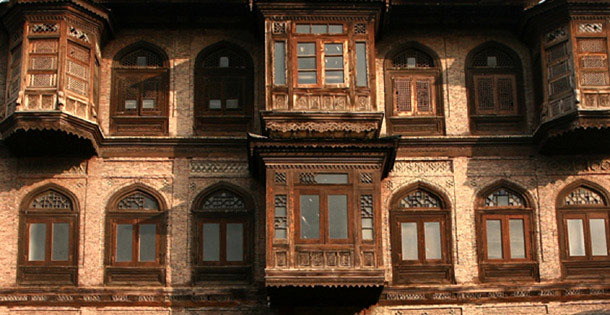 His periodic visits to Kashmir are strange acts of half-return: he asks himself whether he is an émigré, a returning native, or a visitor from another planet. The present suite of photographs expresses his attempt to deal with the profoundly mixed feelings attendant upon these visits to a city that used to be home, a landscape that used to be homeland. 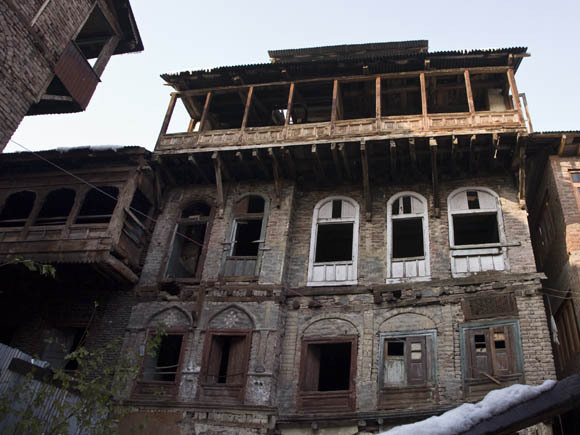 It is an accounting for what is lost and cannot be redeemed; for Munshi knows how completely Kashmir has changed around these houses that are slowly falling into disrepair, ruin or partial reuse. A generation of Kashmiri Muslims has grown up without ever knowing what a Pandit looks like, or what it means to live in a multi-religious society. Each image is stark, plain-spoken, without embellishment, and indeed silent and quite simply itself. There is no annotative manipulation of these images, no theatricality, no vein of melodrama, no overtly elegiac air, no demand for sympathy. There they stand, in our line of sight: ruins, monuments, memorials. This is testimony to the unforgiving march of history, which takes no prisoners. Occasionally, the photographs encode personal references: memories of the street one lived in, one’s own house; the homes of relatives and friends; the neighbourhood now inscribed over with the names and occupations of others. We stand hypnotised by these empty husks of houses, bodies from which the souls have been evicted. Are these points of recall, or thresholds of farewell? Ranjit Hoskote, ‘Dodging the Land Mines of History’ (note in the exhibition catalogue of ‘Encounter: A Solo Show by Veer Munshi’; New Delhi: Art Alive & India Habitat Centre, August 2006). Vijay Simha, ‘In exile at home’ (with photographs by Uzma Mohsin; Tehelka; New Delhi: 29 November 2008, pp. 10-19). I was not only moved but felt like a lost person after watching this movie presentation. 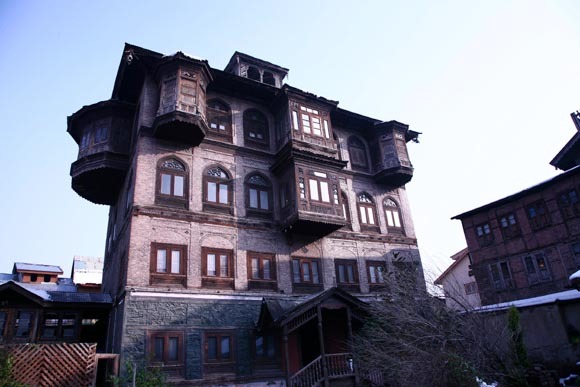 I still don't know the fate of our ancestral home in Balgarden, Srinagar. The images have brought life to Artiji's touching song. Hope one day we all can go back with dignity. I spent seventeen years of my youth in one of the houses you have covered in your video. Lots of memories rekindled. Thanks for adding the song to the heart wrenching pictures. I wrote the song almost 7 yrs back and finally recorded with music in my cd last two yrs ago and all along I wanted to have some video to go along with it. 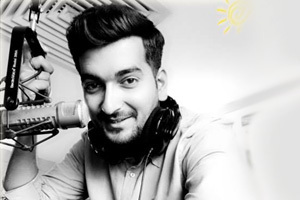 Great job done Deepakjee! Ranjit's chronicalling of Bhatta exodus from Kashmir is tenacious.He has discussed history and chemistry of ethenic cleansing with candour.It must have taken great deal of research.He has hardly missed any link in this great saga of despair.We owe him a debt for his bold efforts. None of the images shown are of Muslim houses. 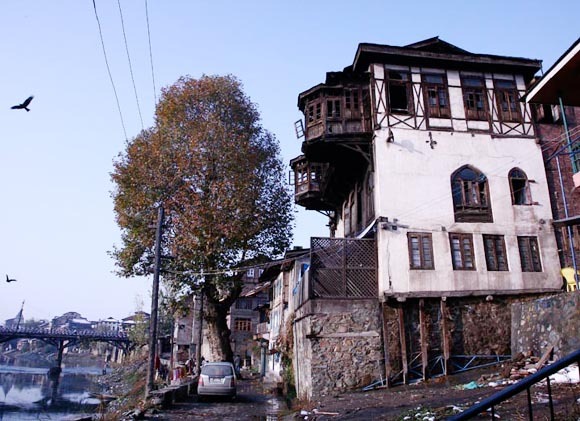 Some of the houses owned by Kashmiri Hindus are now occupied by Muslims in the area including my own home at Malik Angan, Fateh Kadal in Srinagar city being illegally occupied by my Muslim neighbor. Muslims want us to sell these homes to them for pennies to a dollar. Veer Munshi, Arti, Ranjit and Deepak along with Team Shehjar have done a splendid job in this presentation of pain and pathos of Bhattas of Kashmir losing their Homes to Islamic terrorists.The pathetic narrative is emotive and thought provoking which needs to be archived properly. 'My Lost Home' hits hard, stands testimony to what happened in 1990 and thereafter. This is on site historical documented museum, still unheard in the worlds largest democracy called 'India'. My heart bleeds, i cant look at these historical errors.....May God bestow you all strength to bring forward the lost heritage to original shape, time & space. The naration of the exodux of Bhattas by Ranjit is simply astounding.He has gone into the history and chemistry of ethenic cleansing of Bhattas with full details which forced Bhattas to run from their Homes in the Valley to save their life and honour. Bhattas owe gratitude to him for his research in this respect. The photographs of the Homes in which Bhattas were born and groomed are stunningly pathetic, evoking memories of their Lost Paradise for no fault of theirs.All photos are realistic yet emotive.It needs a genius to take such evoking shoots which depict and discuss also. Arti has created pathos and pain by her pathetic voice which melts in the background of these, now converted ghost houses.Her sweet voice lilts Bhattas to glorious old days when there was peace,calm and beauty everywhere.She cries with the soul of Bhattas. 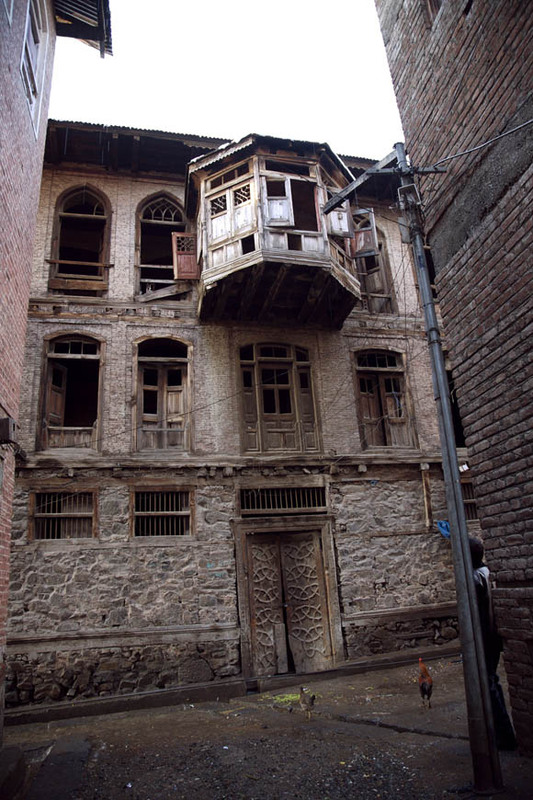 All Bbhattas were born and groomed in thse Homes of peace and calm till they were ejected out by Islamic fundamantalists from these nests.Veer Munshi has picturised these Homes turned ghost houses with details of despair and doom which evoke sympathy.It must be work of a genius to shoot such real pictures . Succesive Indian govts have lacked the will to solve the problem. As I said the worst enemy of the hindu is the Hindu. 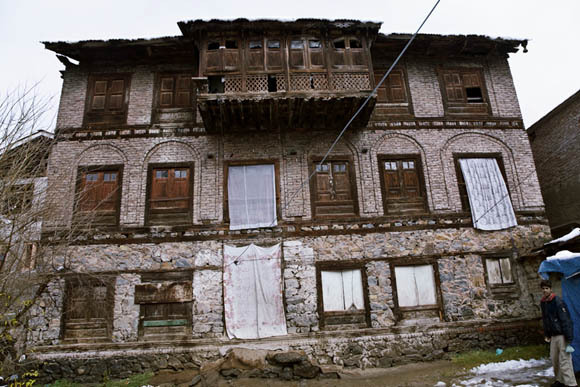 My wife also lost her home in Srinagar along with several relations who were murdered by militants in 1989. The Hindus of India watched. My Lost Home is the best presentation thus far of our lost homes. The pictures and lively video presentation reminds us not only about our own home but also about our neighbors homes. How we used to chat and exchange our seyn from the window and now we see hanging cloths of the Muslims who are living there. I saw my warivich kani and shanshin where one day I used to do tomul cchattan and my children used to play during winter season. Neighbors used this kani as community hall for saal on their childrens wedding. And today our muslim neighbor is enjoying the whole house without even owning it. My "maleun ghar" with which my all childhood's good and bad memories are attached is owned by another muslim. What an irony of the fate. Tears trickled down from my eyes while seeing my home and listening to the background songs of Arti ji. You may express your wishes and aspirations but what will be the outcome? Your house is gone since 1989. That is TWENTY years ago. YOU HAVE TO BE REALISTIC. The way you have worded the SUBJECT (My Lost Home) says a lot. It is anguished cry of someone forced out of his home. It was not sold by you. It was not gifted by you. IT WAS SNATCHED BY BARBARIANS, and YOU WERE FORCED OUT. I was 11th Class student when we left Kashmir and after 20 Years , i still find my memories on a small canal in my village Kandi Khass in every Morning waiting for my class mater and chating for more than hours and then wash my face and have a Gada of water on Shiv Ling and went Home to get ready for School. 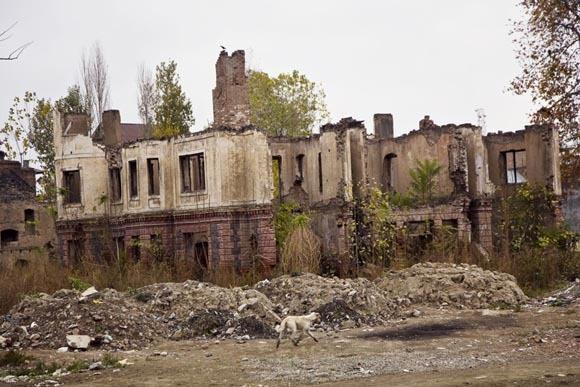 These Photos speak of the past glory of the intelect community.Unfortunately i have seen these houses being burnt and destroyed in front of me.Because of the situation i had to be duff and dumb with just tears trickling down by eyes over the ravines of my lips.it was really tragic and now it is a history.